Our second attempt at a zombie effect. 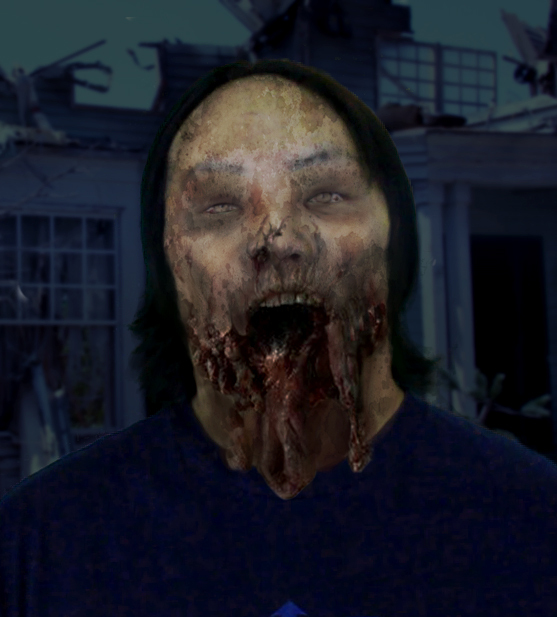 The broken jaw is from the The Walking Dead and the background is from the set of War of the Worlds at Universal Studios. We had a hell of a time trying to animate this effect. Tracking the face was one thing, but we also had a hard time making the effect look real. When the zombie moves, his jaw should sway from side to side. But since his jaw is only an image, there’s no way we can move it around. Just too many moving parts to make it look right. Next time, we’ll dumb things down. Instead of a broken jaw, we’ll paste a simple flesh wound. This should make it easier for us to animate and make it look real.